Otto Borchert was born in Milwaukee on August 12, 1874. His father, Frederick Borchert, born in Mecklenburg, Germany, was an owner of the F. Borchert & Sons Brewery (which would become the Jung & Borchert Brewery and later be bought out by the Pabst Brewing Company). Otto's mother was the former Barbara Neubauer, of Milwaukee. The family lived at 269 8th Street [North 8th Street between West Kilbourn and State Streets] at the time. At the age of 14 Otto left school and joined the employ of Benjamin Young, a wholesale saddler and hardware distributor on North Water Street, signing a contract for $2 a week for the first year and $5 a week for the second. The young Borchert did well in this business. So well, as a matter of fact, that half way through his second year he was offered $7.50 a week from another firm. Otto later told the story: "I was all set to jump my contract and take the big money, but my father made me stick it out and the advice he game me then has helped me plenty in my dealings with ball players. When a young fellow nowadays tried to run out on a contract, I always tell him about the Goll & Frank offer and how I stuck to my job in spite of the fact that I was losing money." Borchert did work for Goll & Frank (located at North Water and East Buffafo) for two years, and then three years with the Wisconsin Milling Company. The young Borchert then obtained a job with the Wisconsin Telephone Co. After a brief time as an office boy he was elevated to a bill clerk, then became a lineman. However, his true calling was found when he became a solicitor for the company "and went galloping about the countryside installing plants." It was said he was responsible for putting more "new fangled contrivances" in rural homes than any other salesman. His record was so imposing that he was hired by Julius Andrae & Sons, a local electronic supply business on Milwaukee's West Water Street [today's Plankinton Avenue] to travel the Midwest. His starting salary was $50 a month—which was soon raised to $75. Otto soon set up a headquarters in Waterloo, Iowa, and over the next 20 years was the Andrae Company's star salesman. However, he never made over $200 a month. While selling supplies for Andrae & Sons Borchert began taking options on electric light properties, then selling them at "profits equal to peanuts at $100 a bag." After his death a story was told how he picked up a 30-day option on the Waterloo Gas Engine, with no money down. Although at first he had a hard time selling the plant, he finally did sell it to the Deere Plow Company for a reported $2,500,000. Borchert's commission was $250,000 and he received an additional $50,000 from the Deere Company. [A photocopy of a check in the collections of the Milwaukee County Historical Society shows Borchert sold the Waterloo Company on March 14, 1921, for $2,100,000.] Borchert also claimed he sold the Dubuque Light & Traction Company for $3,000,000, the MacGregor Light & Power Company for $360,000, and the Sumner Light & Power Company for $60,000. 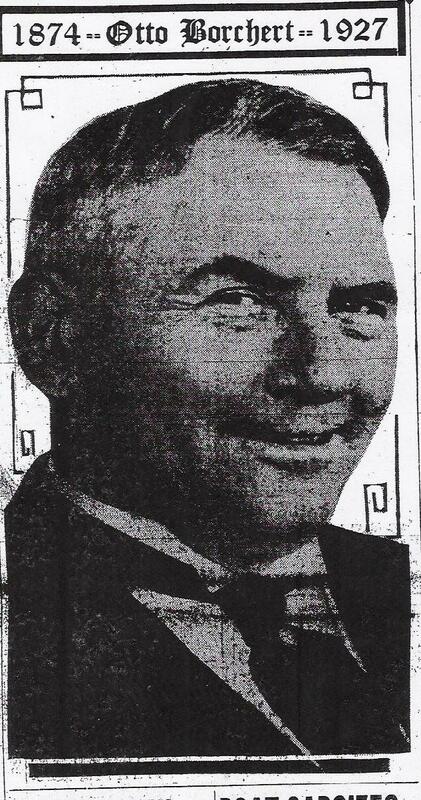 Borchert did retain the position of vice president of the Peoples Power Company of Westgate, Iowa, into the 1920s. Already in the 1890s Borchert was prominent enough to be found in the Milwaukee newspaper society columns. On December 24, 1899, Otto Borchert married Miss Idabel Ruby Wilmot, a teacher of stenography and commercial methods. The Borcherts would have one daughter, Florence Mila. Borchert was something of an athlete in his youth. In 1894 the 19-year old Otto was found catching for the Wisconsin Telephone Company baseball team. He reportedly ran hurdles with exceptional speed, and it was said "he played one of the meanest games of pool in this section of the country." Otto also said he found interest in playing rummy and poker. Otto Borchert was also involved as a boxing impresario, calling it his second favorite sport, behind baseball. 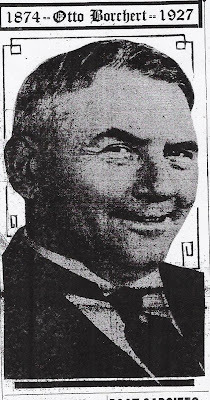 Along with Frank Mulkern he owned controlling interest in the Cream City Athletic Club since 1919, conducting boxing shows at the Auditorium. 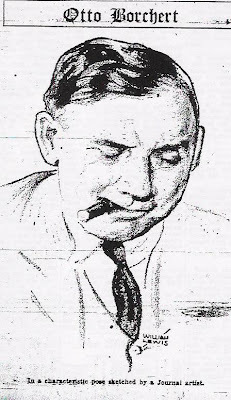 Mulkern, who was called "one of the shrewdest promoters who ever arranged ring brawls in Milwaukee" by the Milwaukee Journal's Sam Levy, said "Otto was the smartest fellow I ever dealt with." In 1919 Borchert and Mulkern were instrumental in bringing Jimmy Wilde, the world flyweight champion from Wales known as "The Mighty Atom," to Milwaukee. 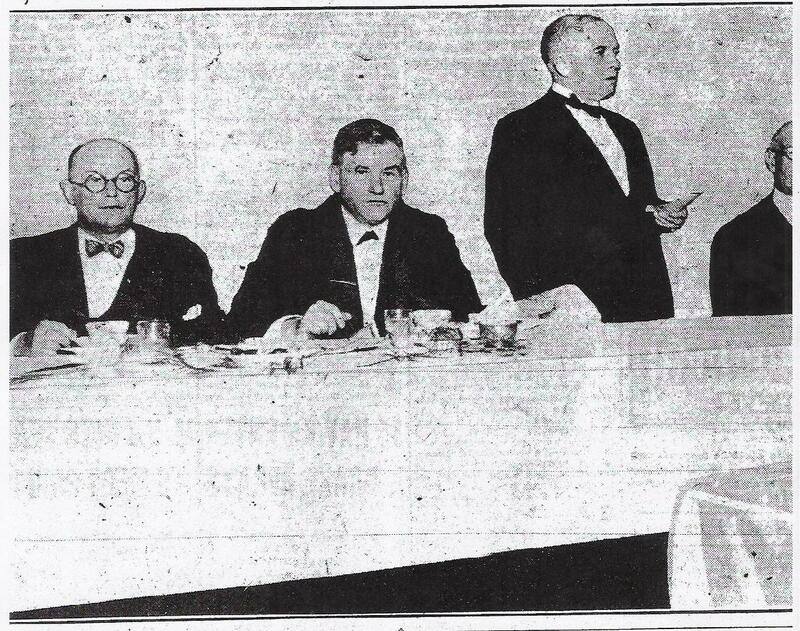 As a promotion Borchert asked all scribes and ringside seat patrons to appear in dinner coats. Even though the Borchert/Mulkern team produced several five figure gates, Borchert said the Athletic Club never made enough money compared to what it cost to run it. Thomas Andrews bought Borchert's interest in the Cream City Athletic Club after his death. 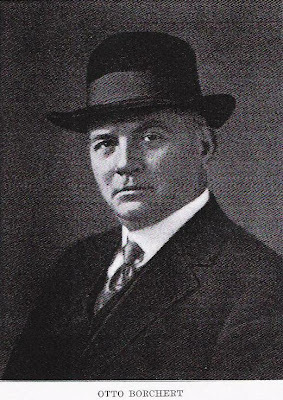 In January 1920 Borchert was involved in the purchase of the Milwaukee Brewers of the American Association from Clarence Rowland and Hugh Brennan for $100,000. At the time it was reported the syndicate that bought the club was headed by Joseph O'Brien, former president of the American Association and at the time secretary of the New York Giants National League club. 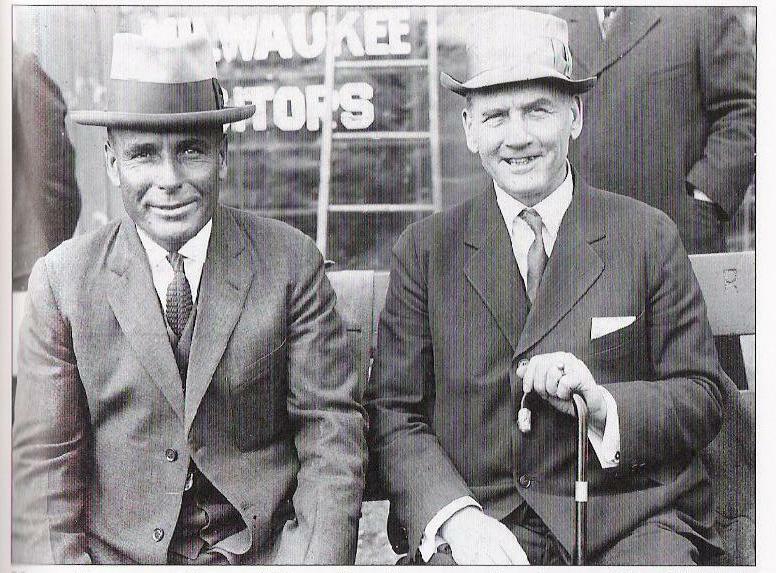 It was later reported Borchert owned 2/7s of the stock of the club, William H. Park [former owner of the Milwaukee Daily News and Evening Wisconsin] owned another 2/7s and William Kinsella [vice president of the Worden Allen Company] owned the remaining 3/7s. The 1926 team was managed by Jack Lelivelt, finishing in third place with a 93 and 71 record. In November 1921 Borchert bought out William Parks share of the Brewers. In January 1922 Borchert bought out William Kinsella, and a number of smaller investors who had picked up stock. This move ended the internal feud that had continued within the club ownership. By 1926 Borchert owned the entire ball club and the park the club played in, Athletic Park at 8th and Chambers. Borchert was rather flamboyant in appearance. He was usually seen walking about swinging a handsome cane, "which seem[ed] to become as famous as Charlie Chaplin's moustache," a derby, spats, diamonds glittering in a horseshoe tiepin, and smoking a cigar—with "ashes spread generously over his vest." While some writers called attention to his silk underwear and other sartorial niceties, he did not call them a habit. As a matter of fact, it appears he loved to buy new clothes, but not always wear them. In one interview with a Milwaukee Journal reporter the Brewer owner was wearing a tweed suit "that could have had the pressing iron without suffering and upon his head was a distinctly disreputable slouch hat." Borchert explained to the reporter: "Look at me. I have just bought six new suits from the best tailor in town and here I am with this on. I have also just bought six new hats—or was it seven—and give a look at this old thing. I am like a fireman. I get dressed in a hurry." Otto also loved the spotlight being a baseball owner put on him—most of all the photographers. It was said he was possibly the most photographed man in the American sport world at the time—doubtful as this could be, when we see how many pictures of Babe Ruth are around. Hung in his office were scores of pictures of himself, all autographed with "Otto Borchert, Pres." Borchert was a life member of the Athletic Club and of the Midland Club of Chicago, as well as a member of the Elks Club, Eagles Club and the Y.M.C.A. He was also a 32nd degree Mason and belonged to the Association of Commerce. Borchert had a reputation for being frugal. Some of this he brought upon himself. He once told a Milwaukee Journal reporter: "I can write a check of any size in a poker game, without stopping to think, but good Lord, how I hate to pass out a $10 bill." Borchert was indeed wealthy, his estate valued at $242,589.15 after his death. He owned a home in Milwaukee at 590 Hi-Mount Blvd. and a "palatial summer place" on Lake Nagawicka. Otto did not know much about running a baseball club when he purchased the club, but had the good sense to hire Louis Nahin, who had worked for earlier Brewer owners, to run the business affairs of the club. In his first year the club netted a $46,000 profit. For the next seven years the Brewers averaged better than $100,000 a year in profit. As owner of the Brewers, Borchert never attained great popularity with the fans. On Sundays and holidays, when the park was generally jammed, Borchert would walk from the right field scoreboard, where he would sun himself before games, to the infield. The crowd jeered, but Otto flashed his broadest smile, waved his walking stick and enjoyed every step as he walked to the stands. "What do I care if the fans boo me," he said philosophically. "It's their privilege. They've paid to get into my park." Borchert's way of signing players was interesting. A few years after his death a report in the Milwaukee Journal explained how he went about contract negotiations. A week or two before the close of the season he would have the contracts ready for his players. He would tell the player "I've called you in to praise you for your great work this year. As a reward I'm going to give you a present. Take this check. It'll come in handy during the winter months. Next year if the club has a good season and we make a lot of dough, I'll remember you." A check for $200, $300 or even $500 was a lot of money in those days, and most players signed within five minutes. But the real side of Borchert was mostly hidden from the public. Upon his death, Brewer business manager Louis M. Nahin said: "His greatest deeds, however, have never been made public. He refused to have the nice things he did revealed. It was not at all uncommon to have many persons call on him during the day and appeal for financial help, and in his own way he always lent a helping hand. 'Keep this secret—I don't want the press or anyone to know about this', he would say". 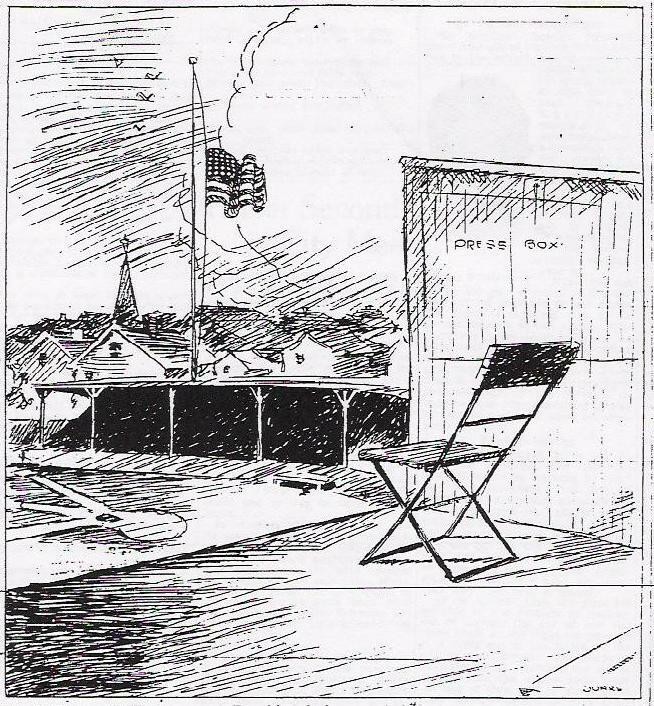 A story by Sam Levy in the Milwaukee Journal years after Borchert's death illustrated this. "The public never got to know Otto. He was gruff and growled at players when they asked for raises. I was in his office one day when the late Nat Stone of the Boston Store, who headed a committee, asked for funds for a worthy cause. 'Put me down for $5,000,' Borchert told Stone, 'but no publicity must be given.' Then he turned to this reporter and said: 'Remember, that goes for you, too—no publicity on my contribution.' 'Why?' I asked. 'Let the public know of what you've done. You receive enough bad publicity.' 'Never mind, I can take it.' countered Otto. 'And look--don't say a thing.'" Otto Borchert was a rough fellow, hard-boiled on the outside. But inside beat a heart warm with sympathy. Only his friends knew of his sterling qualities. "My father once told me, " he said, "Otto, if you can make five friends in your lifetime you will have done well." He not only made five, but 100—true, loyal friends, friends in all that the name implies. They will miss Otto, his keen wit, his sparkling repartee, his caprices, his loyalty. For Otto Borchert was a true friend. He was strong in his convictions, too strong possibly at times, but he had the courage of those convictions, and was willing to battle for them. A more diplomatic policy might have been better, but he drew a line and always tried to stay on it, regardless of what the general public did or thought. But the general public did not know the real Borchert, the fellow who would yell about a dime and in the next breath write a $1,000 check for some worthy charity or some friend in need. He seldom talked of those good deeds, but always made a noise about some minor expenditure that didn't amount to anything. This gave the public a false impression of Otto, poor Otto, who had befriended scores of down and outers, who went on dozens of worthless notes and always had a liberal purse for charity. All through his ownership of the Brewers Borchert had a soft spot for children. It was told how hundreds of kids would follow him to Athletic Park, asking if he would let them in. He would shake his head, but finally grab some youngster and say: "Well, come on in, but this is the last time." Of course, the children knew better and the show would be repeated the next day. 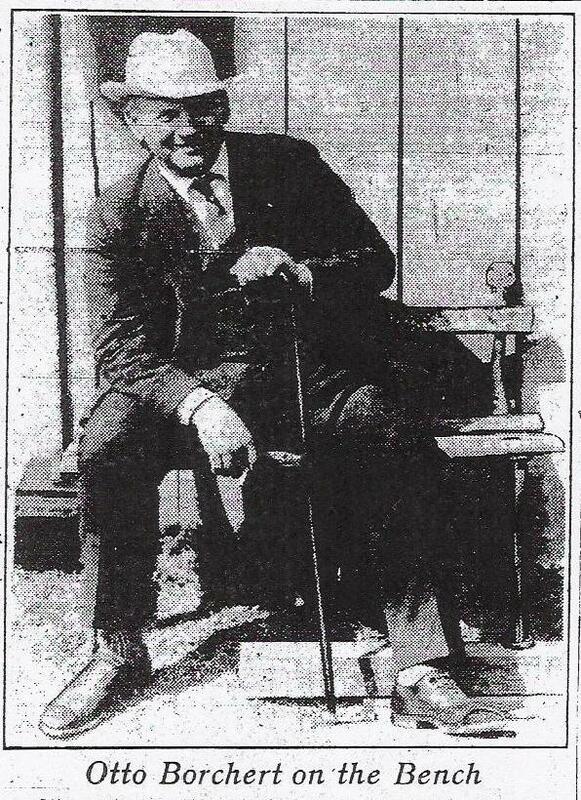 As the owner of the Brewer baseball club Borchert was many times called lucky. In some ways he was, for example, in the seven years of his ownership it was reported he never had a Sunday game rained out—at home or on the road. The papers reported he also had "The Borchert Luck" when it came to getting large amounts of cash for players. However, one would have to believe more than just plain luck went into many of his transactions. It was claimed he bought Fred Schulte for $1,500 and sold him to the St. Louis Browns for $75,000 to 100,000 in cash and ball players. Other sales included Jim Cooney to the St. Louis Cardinals for $22,000; Denny Gearin—whom Borchert bought for $750—sold to the Giants for $10,000; Glenn Myatt to Cleveland for $50,000; Oscar Mellilo to the St. Louis Browns for $26,000. The story told by Milwaukee Journal writer Sam Levy is a favorite. One day [around 1921] a lad with a tattered cap walked into his office and asked for [business manager Louis M.] Nahin. "I want to sign with the Brewers," said the visitor. Just then Borchert entered, listened and went into his private office. When the youngster left, he called to Nahin. "Who was that punk?" asked Otto. "Heretoafter when they come into my office, have them take off their caps." "That kid," prophesied Nahin, "will bring you a fortune in a year or two." "Who said so?" "Wait and see," suggested Nahin. In December 1923 the punk, Al Simmons, was sold to the Philadelphia Athletics for $40,000 and three players, plus a fourth player in May of the following year. In 1953 Al Simmons was inducted into baseball's Hall of Fame. "Those who did not know Otto called him selfish, but they did not know the true Otto. He was one of the strongest characters in the American Association and took the lead in all his business dealings. He had an excellent business head. In our councils he was always looking out for the interests of the league rather than his own club." "His heart and soul were wrapped up in his favorite sport—baseball. He was more than an owner—a fan. I have yet to find another club president who would attend the games of his club and root like the fellow who pays his admission at the gate." A little known footnote to Borchert Park at 8th and Chambers, is that a year or so before Borchert's death he had a chance to trade Athletic Park to the city for Garfield Park, at 3rd and Chambers [now Clinton Rose Park]. 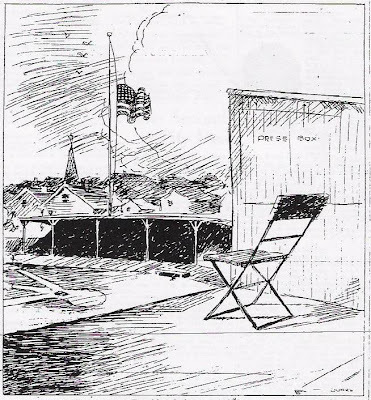 Borchert said: "Garfield Park would be an ideal site for a new ball park, but I'll not undertake such a venture because I'm afraid I won't live too long." On the evening of April 27,1927—the day before the Brewers home opener—while finishing up an address to a large crowd at the Elks Club in downtown Milwaukee, which was also being broadcast on radio—Otto Borchert suffered a massive heart attack and fell back into his chair. After staggering to his feet he was taken into an anteroom, where he died five minutes later. His final words were fitting to the man: "I always made it a point to be loyal to my employers, and—give them the best I had". Otto Borchert was buried in Milwaukee's Valhalla Cemetery. The ball club was now run by Borchert's widow, with the help of Milwaukee lawyer (and former Boston Red Sox owner) Henry J. Killilea and Brewers business manager Louis Nahin. 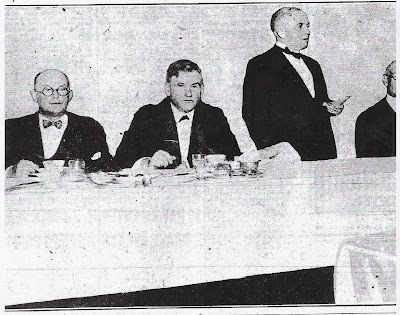 Killilea purchased the club from Mrs. Borchert in January 1928 for $280,000, reported to be the largest amount ever paid for a club in the American Association. (Mrs. Borchert kept control of the ballpark, purchasing it from Timm Realty for $90,000). Upon purchasing the club, Killilea changed the name of Athletic Park to Borchert Field in honor of Otto Borchert.